Black Gold Cookies are crisp on the outside, rich and fudgy on the inside. 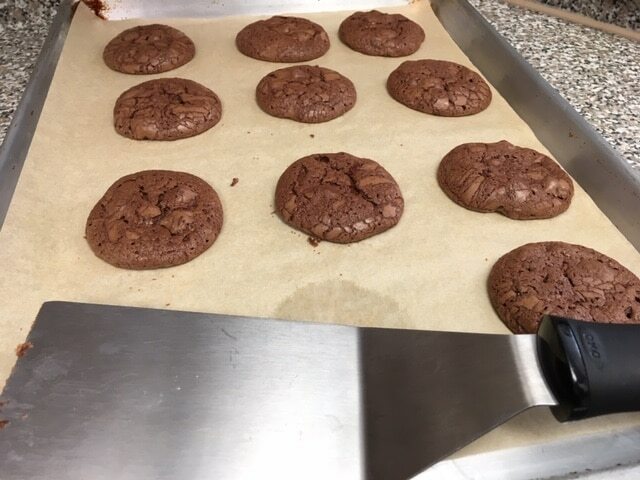 I’ve been testing chocolate cookies for the past year, looking for cookies that didn’t turn out too hard. Black Gold Cookies must be the right ones–I’ve made them twice and they disappear off the cookie plate immediately. “They’re so addictive!” is what I keep hearing. The original recipe is from “Death by Chocolate” by Marcel Desaulniers (1993). For about the past 6 years or more, I have been unable to find unsweetened chocolate in the local grocery stores. I searched online and found a reliable substitute. For each 1-ounce block of unsweetened chocolate, substitute 3 tablespoons of cocoa powder and 1 tablespoon of butter or vegetable oil. When I use this substitution, I blend the cocoa powder with the dry ingredients and the butter or vegetable oil with wet ingredients. To melt chocolate in the microwave, place it in a microwave-safe dish. I like to use a 4-cup Pyrex measuring cup because it has a handle. Microwave for 20-30 seconds at a time. Stir very well after each time. You’ll be able to see the unmelted bits. Microwave just until all of the lumps of chocolate are melted and it’s creamy. Melting the chocolate with butter or vegetable oil is easier than just the chocolate chips alone, and it seems to melt quicker and be smoother. 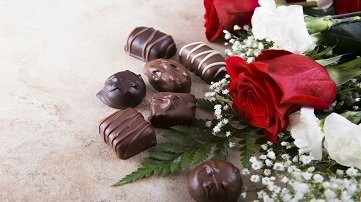 Don’t ever add water to chocolate when melting–the chocolate will seize and solidify and can’t be re-used. You’ll love Best-Ever Hot Fudge Sauce as an ice cream topping or whatever you would like to use it on! I was frustrated when I misplaced this recipe and ecstatic when I found it. I put it in this blog so I can’t lose it again. Sift together the flour, baking powder, cocoa and salt. Set aside. In a large microwave-safe bowl, place semisweet chips* and butter. Microwave for 20-30 seconds at a time, stirring after each time, until butter and chocolate are just melted and everything is blended. 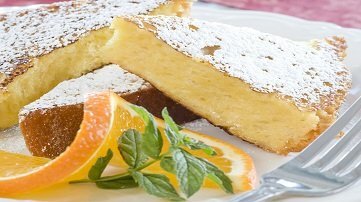 Place the eggs, sugar and vanilla extract in the bowl of an electric mixer; beat about 4 minutes until soft and well blended, scraping down the sides of the bowl. Add the melted chocolate mixture and mix until blended, about 1 minute. Scrape down the sides of the bowl. Add the dry ingredients (and the remaining chocolate chips*) and mix on low just until blended, about 30 seconds. Scoop cookie dough (about 3/4 oz.—I use a #40 scoop) onto cookie sheet, evenly spacing 12 cookies. Bake for 13-14 minutes. 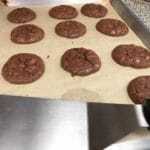 Remove the cookies from the oven and allow to cool to room temperature on the baking sheets, about 30 minutes. Store the cooled cookies in a tightly sealed plastic container until ready to serve. * The original recipe called for about 2/3 of the chocolate chips to be melted with the butter and the remaining 1/3 of the chips added last to the cookie dough. Note: Scoop remaining cookie dough balls onto a parchment-lined baking sheet and freeze until firm. Keep in the freezer in a ziplock bag; bake as needed. They also keep well when baked and frozen.